Rockaroni & Cheese first performed on May 4th, 2008, opening for The Biscuit Brothers at Kyle Front Porch Days' Plum Creek Music Festival. 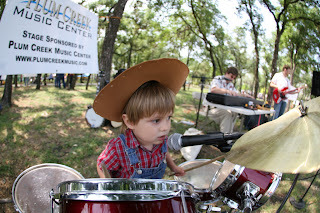 Milo was just 2 years old, but even at 2, he rocked on the drums. 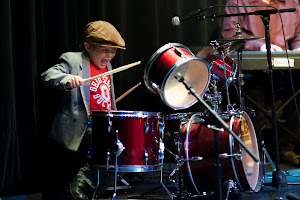 Now he is 10 1/2, & his 7-year-old brother Eliot has joined the band. They are the Rockaroni to their dad's Cheese. DAdam (Dad + Adam) has played piano since he was 7 years old. He's taught piano since 1999, and now he teaches Eliot, too. Milo and Eliot have a 3-year-old brother, Emmet, who makes appearances at some performances. Last March they played for the nationally-syndicated radio show Spare the Rock, Spoil the Child's "Family Friendly Tribute to David Bowie" during this year's SXSW. When Rockaroni & Cheese isn't making music, they're making movies. Their YouTube channel has gone viral, leading to thousands of subscribers and millions of views.